Because an attic is one of the least-seen spots in your home, it is natural for it to become a repository of items that you don’t use very often or things that you just don’t want cluttering up your everyday life. From old clothes and family heirlooms to used college books and toys from a bygone age, these belongings can end up occupying so much space in your attic that a makeover, coupled with intelligent solutions, becomes necessary. As one of the most trusted residential and commercial home improvement contractors in Newtown, Connecticut, Superior Remodelers continuously looks for ways to make your home more beautiful and functional. We understand that your attic is one of the most important storage areas of your home, and that’s why we are committed to discovering the most efficient and cost-effective solutions that will allow you to make the most out of this space. Storage cabinets and shelves – Made from heavy-duty components, our storage cabinets and shelves can hold storage containers, allowing you to enjoy more free floor space in your attic. Storage boxes and bins– Organize your belongings neatly and properly by stashing them in these containers. 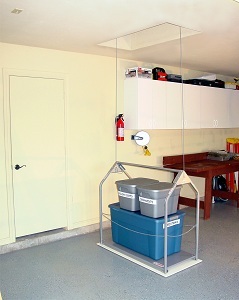 Lift storage systems – Move heavy objects to the attic easily through our mechanized lift systems. Just slide the cargo on and off the platform, and they’re good to go. Lift rail systems – Avoid the risk of serious injury by installing a railing implement which will help you enter and exit the attic opening safely. To find out more about our attic storage solutions and utility lifting systems, please call us at 888-330-8148 or contact us by filling out this form. You are also welcome to visit our showroom to see for yourself how these products work and how they can help with the attic storage challenges you are facing. 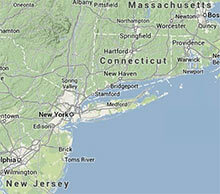 Superior Remodelers serves clients in the states of Connecticut, New York, New Jersey, Rhode Island, and Massachusetts.